The only difference between the "German" and "French" templates is that there is a much more gradual step in the scrape from the "heart" of the reed down to the tip on the french template. When you look carefully at reeds made from each of the two templates and compare them, it will look as if the german template reed has a much more clearly defined tip area. Question: What is the difference between oboe reeds made from cane gouged with a C/S (centre to side ratio) of 0.15 and 0.18? Question: What is the difference between the reeds which have been shaped dry as opposed to wet? What effect does this have on the reeds tone/ intonation? Answer: The reeds shaped dry and wet are actually shaped on the same shaping tool. The difference is that if the cane is soaked before shaping, it comes off the shaper more narrow after it has dried than when it is shaped dry. Therefore, shaped wet cane has a tendency to be higher pitch than shaped dry on the finished reed. 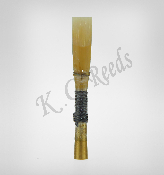 Cane shaped dry has a more "full" tone and is more vibrant due to the greater surface area of the reed.